This set of Microwave Engineering test focuses on “180 Degree Hybrids”. 1. 1800 hybrid is a network in which there is a phase shift of 1800 between the input signal applied and the output taken. Explanation: 1800 hybrid is a four port network that has one input port and two output ports. The phase difference between the 2 output ports is 1800. 2. Port 1 and port 4 of 1800 hybrid are called sum and difference ports respectively because of their behavior and action mechanism. Explanation: When a 1800 hybrid is used as a combiner, with input signals applied at port 2 and port 3, the sum of the inputs will be formed at port 1, while the difference will be formed at port 4. Hence they are referred to as sum and difference ports. 3. S matrix of 1800 hybrid consists of all diagonal elements zero. Explanation: If all the ports of 1800 hybrid are properly matched, no power is reflected back to the same port. Hence all the diagonal elements of the S matrix, Sii=0. 4. In 1800 hybrid, different power levels can be received at the two output ports of the hybrid. Explanation: 1800 hybrid is a symmetrical coupler. Hence, the input power applied at the input port can be divided equally and obtained at the 2 output ports. Unequal division of power is not possible in 1800 hybrid. Explanation: Given that the system impedance is 50 Ω, the characteristic impedance of the arms is 50√2. Hence the characteristic impedance is 70.70 Ω. 6. In a waveguide magic-T there is no coupling of power between port 1 and port 4. Explanation: Consider TE10 mode incident at port 1. There is odd symmetry about guide 4. Because the field lines of a TE10 mode in guide 4 would have even symmetry, hence there is no coupling between port 1 and port 4. 7. When a TE10 wave is incident on port 4 of a magic-T, all the power is coupled to port 1. Explanation: When port 4 of a Magic-T is excited, port 1 and port 4 are decoupled, due to symmetry. Port 2 and port 3 are excited equally by the incident wave with a phase difference of 1800. 8. The tapered coupled line 1800 hybrid can provide an arbitrary power division at the 2 output ports of the coupler. Explanation: When the arms of the coupled line is tapered, they result in division of power at the two output ports unequally and they offer a bandwidth of one decade or more. 9. The plot of frequency V/s S11 parameter for a tapered line coupler has a dip at the frequency at which it is designed. Explanation: When port 1 of a tapered coupler is excited, no power flows back to port 1 since the ports are matched. Hence, S11 value is almost zero or negligibly small and hence has a dip at the designed frequency. 10. For a tapered line coupler, the curves of S12 and S13 are identical and have the same magnitude at all frequencies. Explanation: Tapered line couplers result in unequal power division at the output ports. These are useful for various applications. Hence the S12 and S13 curves are not identical since the power outputs are not equal. 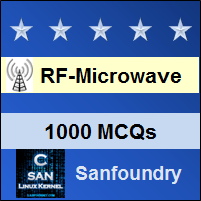 To practice all areas of Microwave Engineering for tests, here is complete set of 1000+ Multiple Choice Questions and Answers.